For optimum results, Kemdent recommend measuring out the appropriate quantity of liquid then adding the powder. After about 60 seconds the liquid will have absorbed the correct amount of powder for optimised handling and physical properties. The resultant mix has the consistency of thick custard, the ideal consistency for use as a reline material because it can be poured easily for optimum control with no slump. 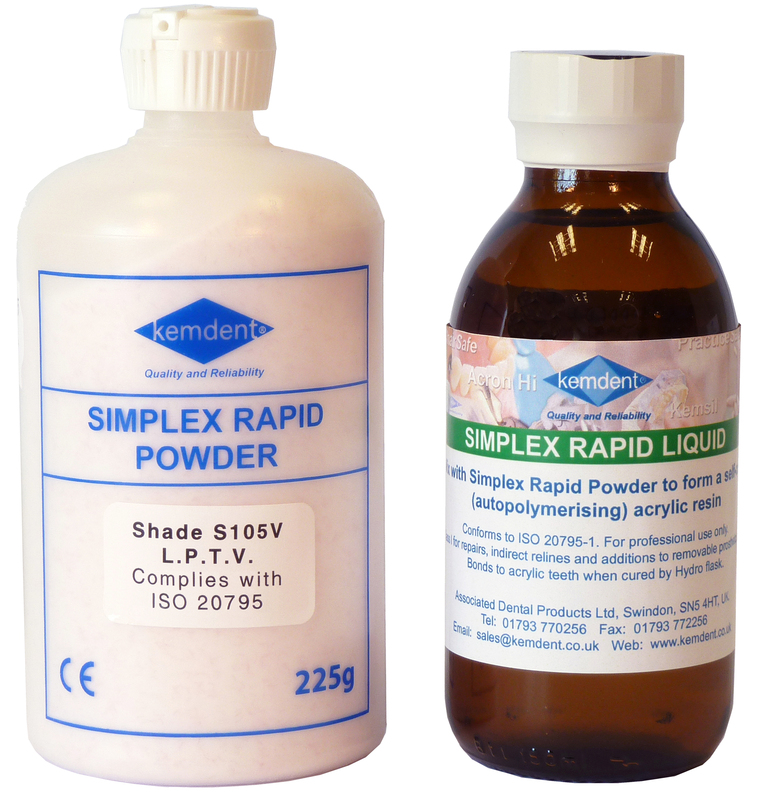 Once mixed Simplex Rapid contains a very low residual monomer level, giving it a high degree of mucous membrane tolerance and minimised porosity important for aesthetics and strength. 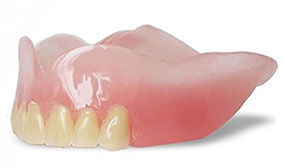 In addition, its high compatibility to acrylic denture bases and teeth means that additions and repairs are much stronger and far less likely to fail. Once cured it is easy to finish to create an extremely highly polished finish, which is well tolerated by the patient’s tongue and soft tissues. SIMPLEX RAPID IS for use by dental professionals only. Kemdent manufactures a wide range of tried and trusted laboratory products, but sometimes it can be difficult to decide which option to choose for any specific indication. This article will highlight the main features and benefits of Kemdent's Acron Hi and Acron Express acrylics as identified by just some of their many advocates in the UK. Acron Hi is a true high impact strength acrylic which is perfect for the provision of high-quality denture work. It utilises Kemdent's unique Multi-Matrix Technology to produce dentures that are highly resistant to breakage and fracture. It produces a soft packable 'dough' that is ideal for all processing protocols including injection moulding systems because it can be processed using a rapid 30-minute or longer curing cycle in boiling water. Once mixed, Acron Hi exhibits a relatively soft 'dough stage' compared with its competitors, which tend to be rubbery in consistency. This makes it easier to pack into moulds because it flows more easily and smooothly, an advantage if you are using an injection moulding process. Using Acron Hi ensures a better fit and requires less post-processing work to finish the denture. It also exhibits an increased stiffness, after processing, which makes it easier to trim and polish for most technicians. Finally, many other acrylics can be cured in just 20 minutes but may contain a high level of residual monomer, which can result in allergic reactions and reduce strength of the finished prosthesis. By ensuring a lower level of residual monomer the technician can minimise the risk of allergic reactions and produce dentures that are stronger and less likely to fracture because of increased cross-linking. They can control the level of residual monomer by always ensuring they use the correct powder to liquid mixing ratio. The level can also be reduced by using a slow cure overnight. Tests show that Acron Hi exhibits a much lower level of residual monomer compared with its competitors. Acron Hi is supplied in 'Light Pink Veined' and Original Veined' shades. Acron Express is a new super-fast dough, heat-cured denture base acrylic designed for the manufacture of full or partial dentures, and is ideal for busy prosthetic laboratories and urgent cases. It takes just seven minutes to reach the dough stage, so laboratories can start packing jobs much sooner. What's more, once it has reached the dough stage, Acron Express stays packable for longer because it has an extended working time of at least 30 minutes at room temperature, allowing laboratories to process more jobs at the same time without loss of quality. Then it can be processed using either a rapid (20 min) or longer cycle in boiling water.
" I've been using Acron Hi for about two years, prior to that I used Enigma Hi and I use it for all my dentures now. I particularly like how cleanly it comes out of the moulds, which saves me time during the final processing stages. I also like the fact that Acron Hi appears to be significantly harder and has a higher flexural strength than Enigma Hi, another very important consideration"
"I started using Acron Hi for my private and independent dentures in 2001, prior to that I used Lucitone. I particularly like the working time, colour because it is slightly darker and it's better value for money. Compared to Lucitone, Acron Hi is a bit firmer in consistency and is easier to process"
"I use both Acron Hi and Express depending upon the clinical situation. I mainly use Acron Hi for partial dentures, though I also use it for some of my full/fulls. I began using it in about 2000, but before that I used Lucitone 199. I particularly like the way Acron Hi bonds to the teeth and its colour. It has a longer dough stage and working time than Lucitone which makes it much better for trial closures. Once processed Acron Hi is easier to finish and polish and you can achieve a much higher polish, which I think is an advantage. It also has a much better shade because it is not orange like Lucitone 199. Before starting to use Acron Express, in 2000, I used either Metrodent or QC20, for most of my cases. I particularly like its light veined colour and the fact that you can achieve a high polish afterwards"